(HIB) – Paul and John were on to something when they penned their ode to good old natural light. The association between sunshine, positive emotion and good health is integral to the human psyche. It’s in our nature to revel in natural light and sing out “here comes the sun” instead of “bring on the artificial light.” Every home has spaces that seem to cry out for more natural light, whether it’s a kitchen with too many cabinets and not enough windows or a first-story hallway where windows just aren’t possible. 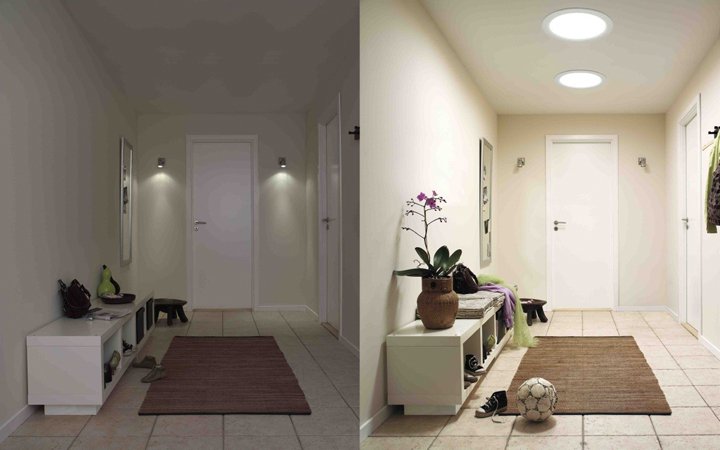 Adding traditional or tubular skylights can be a great way to bring more natural light and fresh air into a space. 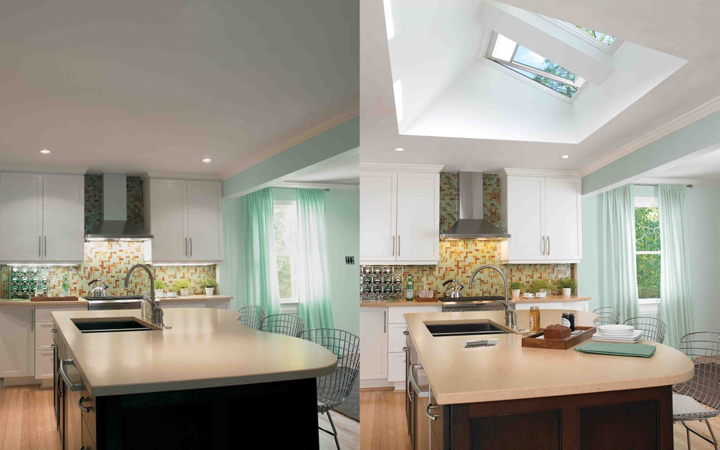 Here are four scenarios when skylights can transform a space – and give you something to sing about. Interior rooms and hallways, first-floor spaces and rooms with limited wall space make it difficult to add windows to admit natural light. Sun Tunnel tubular skylights from skylight manufacturer VELUX capture sunlight at the roof and convey it through a reflective tube into lower-level rooms like this windowless first-floor hallway. The natural light brightens the space, making it feel larger. 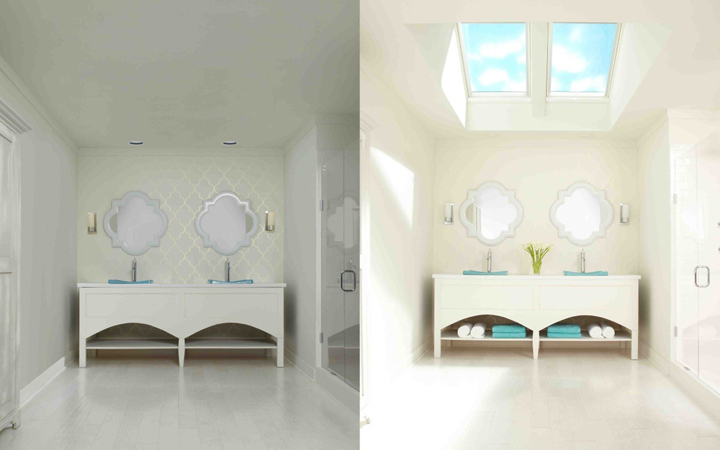 Balancing privacy and light in a bathroom is a delicate juggling act. Designers may include a large window in a bath, only to have homeowners cover it with a blind or shade in order to ensure neighbors don’t get a free show every morning. Adding solar powered fresh air skylights with designer blinds provides a bathroom with ample natural light and fresh air without sacrificing privacy. A programmable touch-pad remote control, operates both the skylights and solar-powered blinds from VELUX for complete control how much light and air enters the room. High ceilings create a dramatic effect, but can also cause a lighting dilemma. Smaller, recessed lights don’t have enough oomph to cast illumination all the way down to seating areas, and a massive light fixture detracts from the drama of the height. 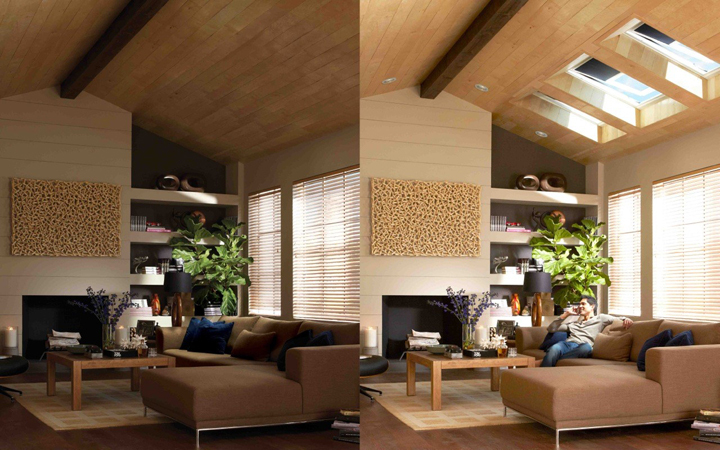 Skylights, however, can infuse even the tallest room with light while actually enhancing a room’s design statement. In some rooms, you simply can’t spare the wall space to add another window. Kitchens – where cabinets consumer a lot of wall space – can especially benefit from the addition of fresh air skylights. Adding under cabinet lighting can help brighten work areas, while skylights overhead brighten the whole room and reduce glare with balanced natural light. And wall space and light isn’t the only consideration. Indoor air quality can suffer when moisture and cooking odors build up, leaving a kitchen feeling stuffy. Fresh-air skylight can provide passive ventilation, allowing stale indoor air to escape while admitting fresh air. Insufficient natural light and poor indoor air quality have been associated with a host of health issues, including respiratory problems. Fresh air skylights can provide passive ventilation, allowing poor indoor air to escape and admitting fresh air along with healthful natural light. To see how skylights can fit in your home and how you can receive a 30 percent federal tax credit on solar skylights, blinds and installation costs, visit www.whyskylights.com.